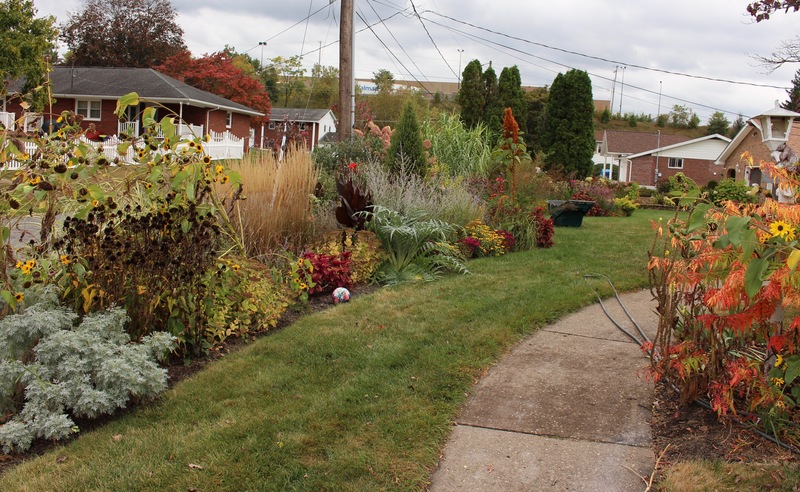 This entry was posted in fall, front border, perennials, Tuesday view, Uncategorized and tagged autumn flowers, monarch migration, pennsylvania garden, Tuesday view. Your garden is certainly holding up well now. Lovely. Thanks John. My fingers are crossed it survives a little longer as we have the possibility of frost Monday. Your gardener sounds a lot like my gardener. I got on him this weekend. Managed to get a little work out of him before he plopped himself down on the porch. 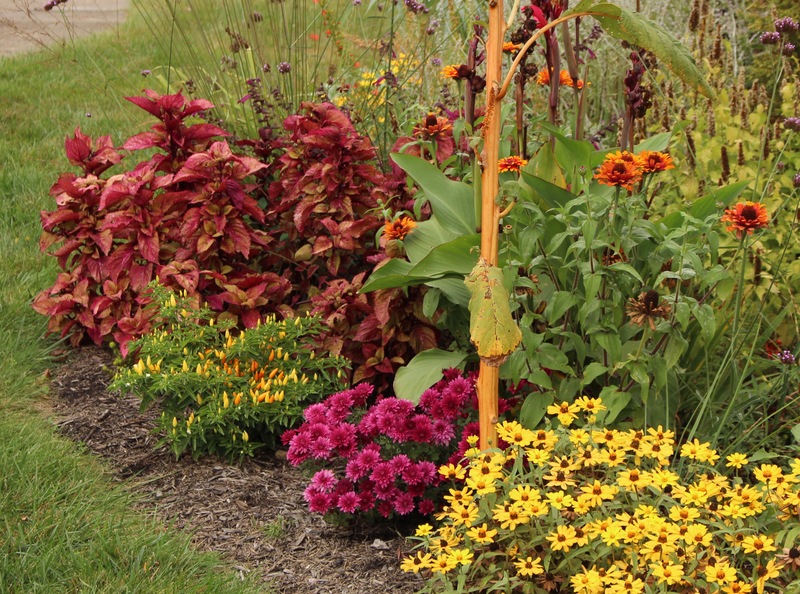 Even in its last stages, your garden is still beautiful with lots of color. Frank. Love seeing your visiting Monarchs. You’re right, it is a wonder they ever get to Mexico, they must fly 10,000 miles, going round and round, to get there! Thanks Eliza. The Monarchs do drift around a lot but then manage to fight a strong wind and come down right on the flower they were aiming for. I think it’s all part of the plan! Your garden is still looking lovely, so much colour in October! I hope your neighbours appreciate all your efforts! It’s good to know that your garden is a stopping off point for the Monarch butterflies, they must appreciate all your late flowering plants, just what they need to get them to Mexico! I’ve really enjoyed the Monarchs coming through this year, and I think they’ve enjoyed the flowers just as much. I wish them all the best for the rest of their journey. Your first photo looks particularly autumnal. We got some but not a lot of Monarchs here this year but got many of the tiny blue native Checkers and native Sulfur butterflies who are at risk due to habitat loss. I was happy they found something in the garden to their taste (Eriogonums). I’m hoping my gardener will snap out of his funk, I dread the thought of finding someone new and I suspect even if I did they would expect some kind of payment other than just the reward of a job well done. Nice that you’re seeing more butterflies as well. I hope they’ve survived the wildfires and it will be interesting to see how they respond to their newly cleared habitat. Your garden looks more like early September than October! 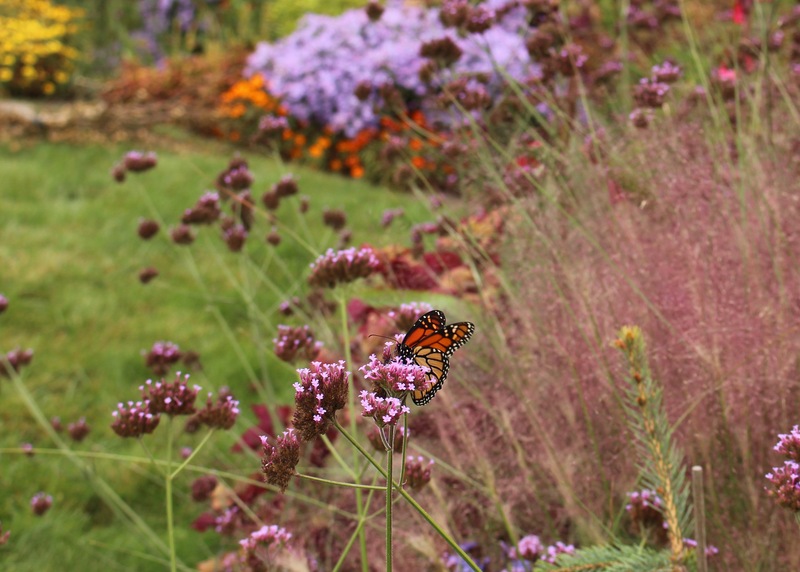 You still have so much lovely stuff to look at – the aster is wonderful and the Muhly grass looks good already. Just looking at these photos should be motivation enough to go out and do some pottering and enjoy the last of the autumn flowers. 🙂 But I have found there is actually little to do in my garden at this time of year, except for disposing of the occasional annual in a pot that has given up flowering for the year! Hope the butterflies move on soon and don’t get swept up in a storm. Ours seem to have all disappeared already. Happy gardening Frank! The weather has been beautiful and I found that a little rain went a long way in motivating me to get out there again. I am being careful though. It’s that time of year when you can either keep at all the little jobs or just let them go and then tackle it all at once. I prefer to just let it go and see how little I can actually get away with. I think I’m finally figuring out what you already know, that there really isn’t all that much that really must be done right now! End of summer maybe (well not really maybe) – there’s no deigning it is autumn now. But the border has proved its worth this year. It has been gorgeous for months. I’m amazed you get seedlings from your Hybiscus; I have several in the garden and I’ve never seen a seed pod or a seedling – ever. You’re right, the border has done well this year. I’ve been really lucky that the weather has been so good to plants here this summer! I’m amazed your hibiscus do not seed around. What a difference your dry climate makes since mine usually leave a carpet of seedlings for each spring. I love the pure white, sterile ‘Diana’, but the others…. I despise their prolific seeding. Oh mercy, a droughty spell does squash the gardener in us all. Those gnats just makes it impossible to get out in comfort. 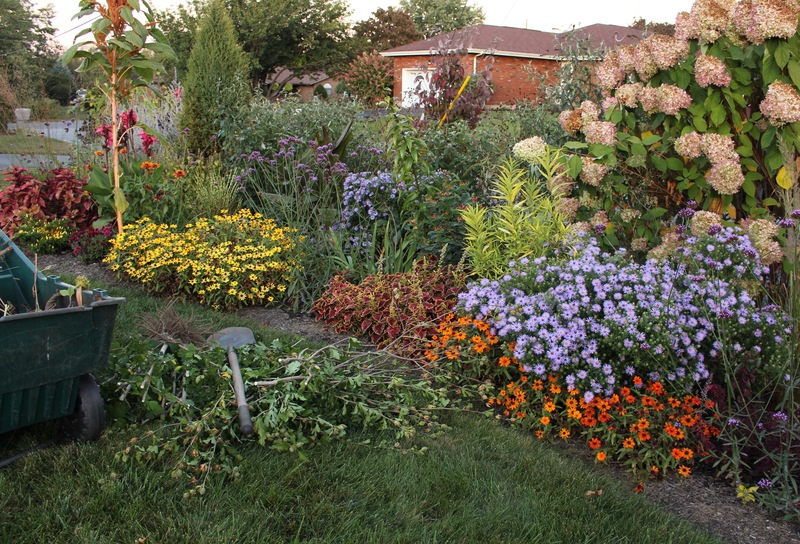 It’s still looking great despite the season and inattention of your gardener. My gardener has also been extremely slothful recently. It’s so hard to get good help these days. I almost fired my gardener last week, but this week he did a little mowing and mulching and I guess I’ll give him another chance. I have no doubts this weekend’s warm sun will have him lazing around again but maybe I can turn a blind eye one more time. Looks very good to me. We have had hardly any rain for two months. Beginning to catch up a bit but coming in little spurts. I have pretty much given up and am waiting for dry weather again to do some cleanup. I don’t seem to have much in the way of fall flowers. Usually I have such terrific color from all my trees that I don’t notice the lack. But the trees are not doing much of anything this fall. Or at least not yet. I’ve given both of my Hibiscus to a gardening friend. The colors here are also heavy on the browns and nothing to get excited about. Maybe the red maples will still do something nice though. I’m actually enjoying the fall flowers this year. Last year I noticed a few nice things, and this year it’s even better. Maybe someday I’ll warm up to this whole autumn thing. I’m more than a little jealous of your pool time! Ours has been closed for a few weeks already and since it’s actually the pool of our neighbor I suppose we really can’t complain! I read you can dampen its enthusiasm by pruning it in spring which I’ve tried but I still had to cut it back twice. The Rosa banksiae is a lot worse though, speak of 4 times rather. 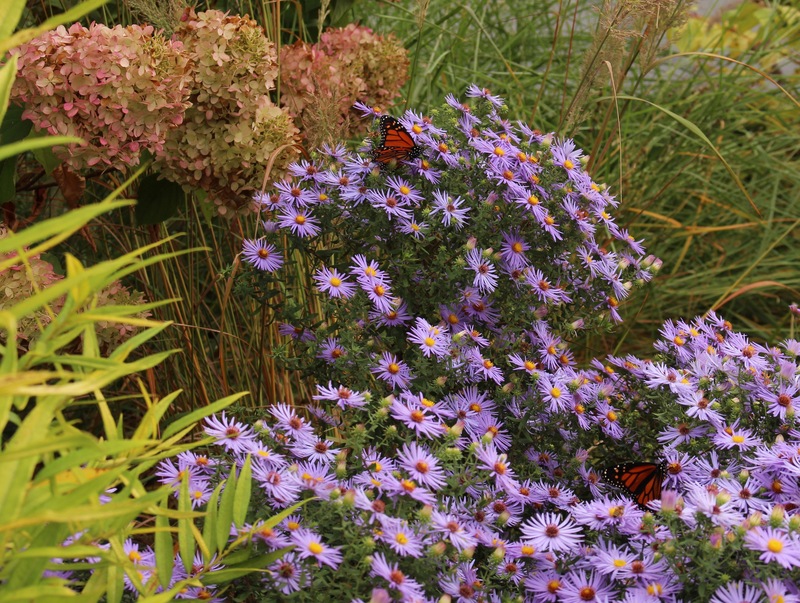 PS: Just made a note of your stunning aster, drought-resistant and pretty is a combination hard to resist! It has done so well for me even during other, rougher growing seasons. So wonderful that you have all those butterflies. ‘Raydon’s Favorite’ is a beauty – I like the straight species as well. Also ‘October Skies’, another variety of the same species, I think. I have finally started to do some mulching and plant moving. The rain made it much more pleasant and I do like thinking about next year rather than worrying about cleaning up this year’s debris. Maybe the winter wind will end up blowing it all away anyway. Your garden always looks fabulous in late summer and early autumn with or without the attention of delinquent gardeners. So much colour and magical butterflies too. It’s been a beautiful autumn… once we got a little rain. The garden always seems much nicer when watered, a shame I’m always too lazy to do it myself.